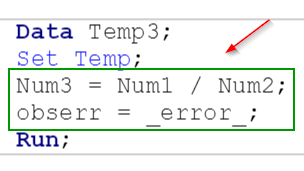 The variable _n_ and _error_ are two automatic variables that exist in the data step. 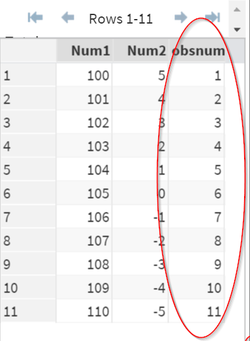 The TEMP data set contains two variables: NUM1 and NUM2. 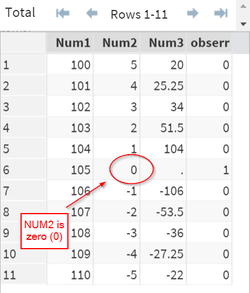 Variable _n_ shows the observation number in the data set. 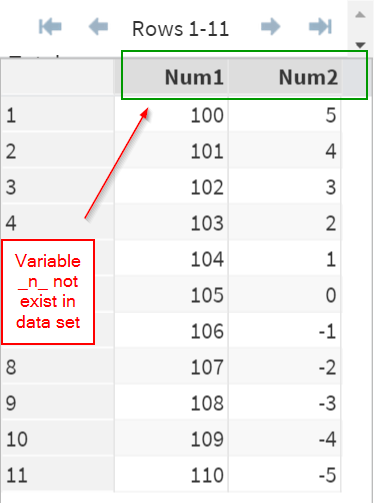 Similar to the variable "a" from the (in=a) option, variable _n_ does not exist in the data set. 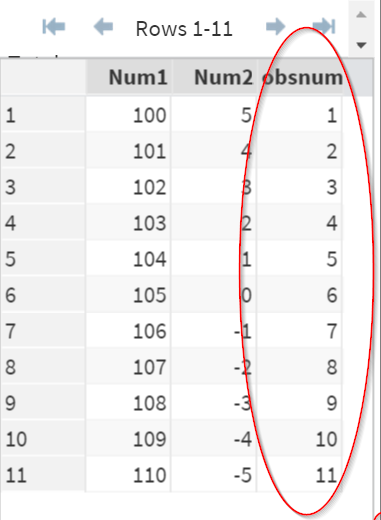 To see the variable _n_, you must copy _n_ into a variable that is visible in the data set. The variable obsnum is the carbon copy of the variable _n_. It shows the observation number of the data set. 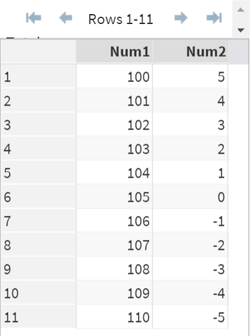 In this example, it shows the number from 1 to 11, which is the observation no. for each observation. Note: the application of _n_ will be explained in later modules. The variable _error_ is another automatic variable built in the data step. It identifies the observation with error. 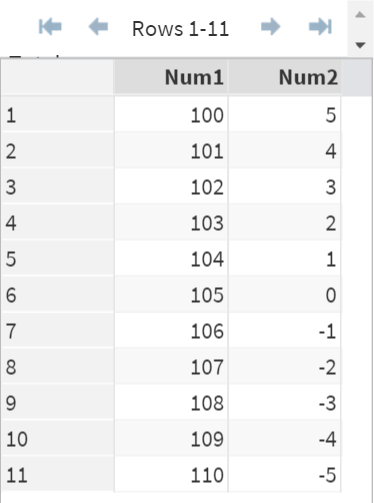 In this example, we attempt to divide the variable NUM1 by NUM2. 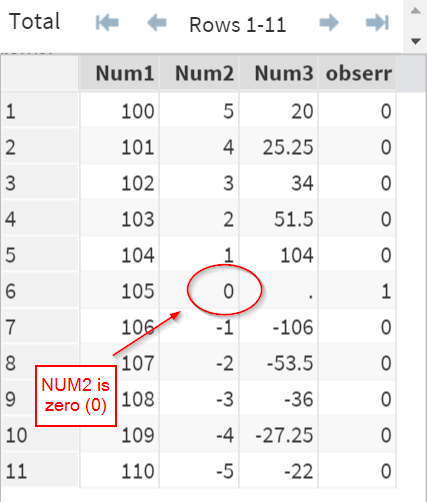 However, NUM2 is zero (0) in one of the observation. This causes an error from the division. 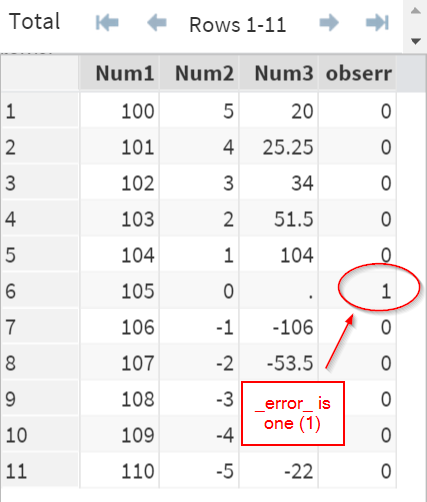 The variable _error_ flags the observation as "1" when there is an error, and "0" when there is not. You can identify the problematic observation by simply using the _error_ variable. Locate the CARS data set from the SASHelp library. Create a data set that contains the top 3 cars with the highest horsepower.